This website is a catalog of currently available items to order A little something jewelry by Sonya M. Fitzmaurice. 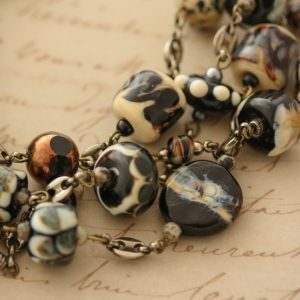 Each piece is one-of-a-kind, crafted with unique lampwork glass and Deux-coupage™ components by the artist. Payment must be made in full at the time of your order and cleared before shipment. Credit and debit card payments are accepted through PayPal. All you need is a valid email address. If you should have any issue with payment, please do not hesitate to contact A little something, and you will be assisted promptly and efficiently. To order a little something jewelry fresh and exciting exclusively for you is always available. Custom orders are the specialty, so feel free to connect about commissioning unique jewelry with your personality in mind. Custom orders generally take 2-3 weeks from the time your complete detailed request is received. An open line of communication is encouraged. Correspondence with you directly via email (smf_alittlesomething@msn.com) or phone (201-263-0679) is supported so that your unique item(s) can be designed and created with insight and accuracy. A little something special for all customers… Free shipping* plus the signature purple box! (*within the continental US only) The unique gift packaging is always included with every order. Your purchase will ship within 2-3 business days of the paid order. All orders are shipped United States Postal Service First Class mail with insured delivery confirmation. Overnight shipping is available by request at an additional charge. Rates will vary depending on destination. International shipping is a flat rate of US$25. Shipments are made to the address provided as the “shipping address” at checkout. Please make sure the information is entered correctly to ensure accurate delivery. If ordering a gift to be sent directly to the recipient, please indicate at checkout if you would like to include a personal note. A customized Take Heart Token card can be addressed with your message to accompany the special gift. Your satisfaction is paramount! If for any reason you are dissatisfied with your purchase, returns are accepted within 14 days with prior return authorization only. Please contact via phone (201-263-0679) or email (smf_alittlesomething@msn.com). Items must be returned in original packaging, and undamaged re-salable condition before a refund will be issued. There is no reimbursement for your return shipping. Insurance for the full value of the item is recommended for your protection since lost items in the mail are not our responsibility. Custom orders are not returnable. If for some reason your item gets damaged, repairs can be arranged at no cost to you. Keep in mind, A little something jewelry is one-of-a-kind, and therefore many components are unique, but replacements may be available. Should a parcel be returned unopened by no mistake of ours (marked “return to sender,” “moved – address unknown,” etc. ), a refund will be issued and the item(s) resold. There will be no further effort to contact you. A little something…® is a collection of one-of-a-kind jewelry items, designed and created for year-round delivery. Though influenced by current trends, A little something jewelry by Sonya M. Fitzmaurice is seasonless and au courant. The collection is updated frequently with new jewelry pieces as supply is sold. If you are interested in carrying the line, special pricing is offered, or an exclusive capsule collection for your shop can be created to coordinate with your inventory. Contact and connect via e-mail (smf_alittlesomething@msn.com) or phone (201-263-0679) to discuss an optimal arrangement. A little something® respects your privacy. Be assured any information collected from you will not be shared with anyone else. If you join the mailing list, please note that from time to time you may receive special offers or information about upcoming events and new products. As part of the mailing list, this also includes a monthly newsletter with articles from the Journal by A little something® and Trend Spotlight®.